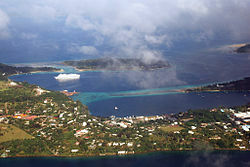 Port Vila (population 29,356, coordinates 17°45′S 168°18′E) is the capital city of Vanuatu. Located on the south coast of the island of Efate, it has the country's most important dock and airport, Bauerfield International, making it the nation's economic and commercial center. During World War II, Port Vila was an American and Australian airbase. In 1987 and 2015, tropical cyclones badly damaged the city. This page was last changed on 25 January 2016, at 05:42.